High quality gemstone globes don’t come cheap, and if you want to get your money’s worth and make your investment last, you’ve got to know how to take care of your world globe. To keep your gemstone globe looking beautiful, you’ll have to make sure that you some periodic maintenance on the orb. Fortunately, such a task isn’t as hard as it sounds. Yes, gemstone globes are delicate works of art that require careful cleaning—doing otherwise could very well damage your gemstone globe’s finish. 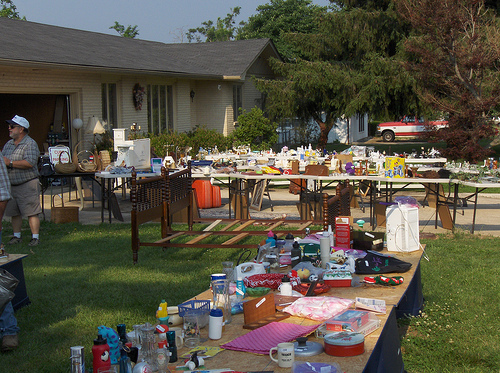 But you can avoid that if you know what to use to when cleaning the globe, as well as the right method in cleaning it. Start with your clean dust cloth. If your gemstone globe only has a thin layer of dirt covering its surface, simply dust it with the soft cloth. You don’t need to have a fancy microfiber cloth or anything—a simple cloth diaper works just fine. 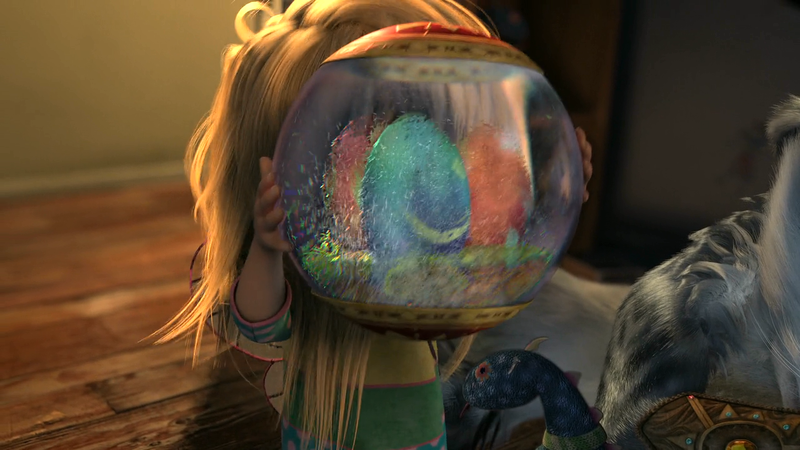 Gently wipe the entire surface of the gemstone globe until its shine returns. Get your Q-tips and use them to clean the gemstone globe’s seems. Use the buds to clean the latitude and longitude lines, as well as the boundaries between countries and states. Despite how tight these seams are, dust can still penetrate the tiny gaps between the gems where regular cloth can’t reach into. If after all that, your gemstone globe still looks dull, proceed to take another clean cotton cloth and dampen with a little water, using it to wipe the globe once more. Whatever you do, don’t using anything abrasive, like rubbing alcohol. Water will do just fine, and anything stronger can potentially damage the your gemstone globe’s finish. After cleaning your globe with the damp cloth, wipe it dry with yet another dry cloth. For a gemstone globe that’s really dirty, for example one that you found in a flea market, drop one to two drops of mild dish soap into a basin of water and use the solution to dampen your cloth. Follow this up with a cloth dampened with nothing but water to remove the soap residue. Don’t forget to wipe dry with a clean cloth. 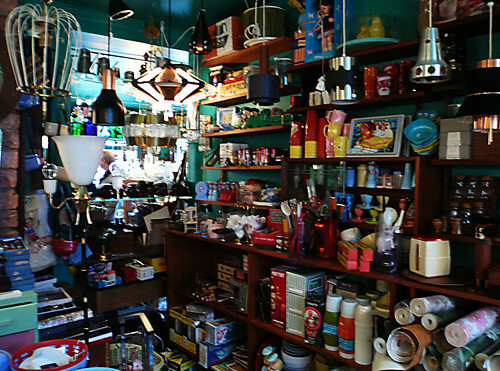 With proper maintenance, your gemstone globe should continue looking beautiful for decades to come. 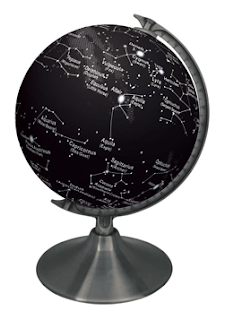 And as the years go by, along with the continual changes in country boundaries, your globe could well become a collector’s item in the future. With all their beauty and splendor, gemstone globes transcend the usefulness of ordinary globes and become a beautiful piece of art in the home or workplace. If a sculpture or painting can add personality and sophistication to a space, a piece as beautiful as a gemstone globe, with its semi-precious gems sourced from some of the world’s richest mines, can likewise have the same effect. 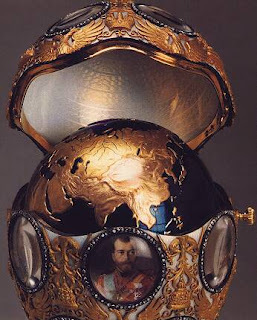 For hundreds of years, gemstone globes have been a prized possession in the homes of the wealthy and elite. 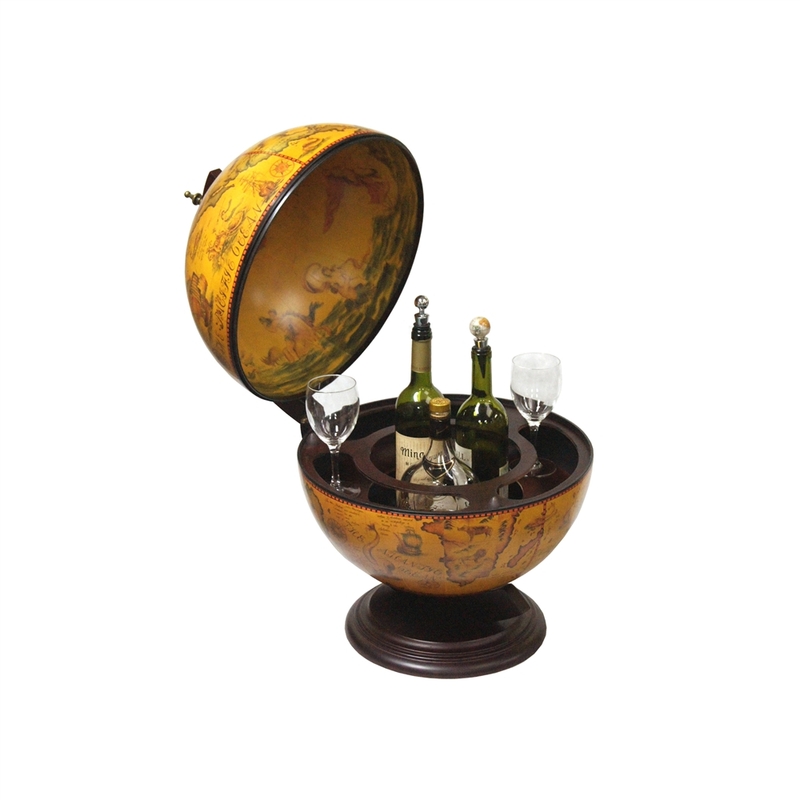 If the craftsmanship of modern gemstone globes is impressive today, one can only imagine the level of precision involved in making the gemstone globes of old, which were hand crafted, with each piece laboriously and loving cut with precision from premium stones. 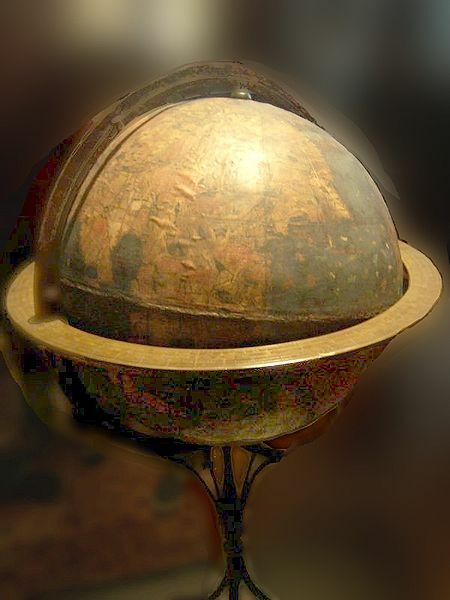 Old gemstone globes were so painstaking to make that artisans could spend days working on just one piece of stone for it to have the right look. But if you thought gemstone globes were all about looks, think again. 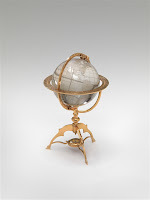 As surprising as it may seem, high quality gemstone globes were also prized for their geographic accuracy. Craftsmen had to make sure that each country appeared in their exact shape, with borders highlighted in a rich gold color. While the world has undergone tremendous changes over the centuries, the process of making gemstone globes has largely remained intact. Skilled craftsmen still work painstakingly over each globe, seeing to it that each gem fits snugly against each other, and that globes are accurate representations of the planet. 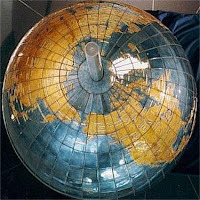 It’s interesting to note that large gemstone globes are perhaps the easiest to make, and the smaller a globe gets, the harder it is to balance detail and a perfect fit—some gemstone globes can be as small as a sphere 7 inches in diameter. Besides learning about the continents, countries, and oceans, an integral part of owning a gemstone globe is learning about your gemstones. 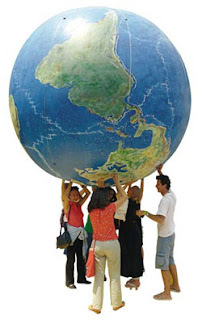 The larger a globe is, the more gemstones it will have. Although the type of gems will vary from globe to globe, you can at least expect to see the most common ones, such as mother of pearl, blue lapis for the oceans, and black and yellow jasper. Regardless of size, however, a beautiful gemstone globe can make for a prized heirloom that increase in value as it’s passed down from generation to generation. Pretty much rhymes with 'hopes and dreams.' 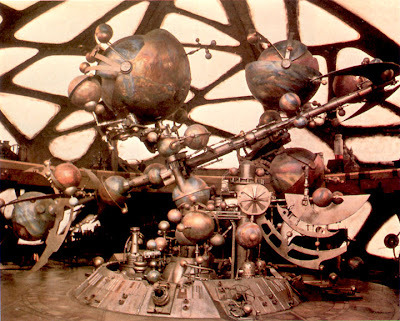 But the history of globes is the history of hopes and dreams. 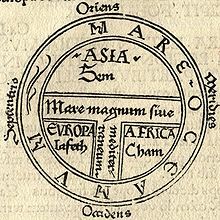 Once Renaissance people lost their fears of "going over the edge" of a flat earth, they replaced these with hopes of finding (and getting their hands on) new lands, new people, lots of treasure, and adventure. 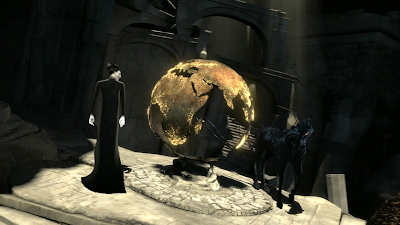 The Curious Dreamer says a world/world globe can represent the environment, people in general or peoply you reqularly interact with. Note the emphasis on problems, control, unknown places, unknown people. 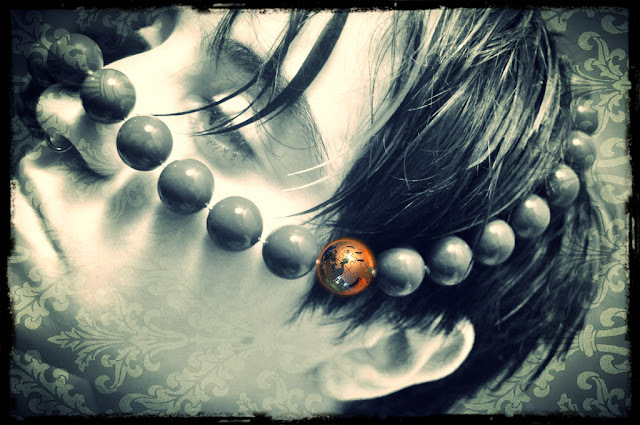 Globes then, are very much focal points for mastering one's fears, aids to facing problems – objects of (perhaps unconscious) meditation; a single link in the worry beads of worlds. It's always comforting, when faced with problems, to know that you have the world in your hands. Probably no other comic book cartoon has made use of globes as a visual hook for audiences more than Belgian cartoonist Hergé's The Adventures of Tintin. 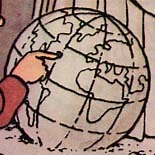 Since the stories in the Tintin comics are set in various locations all over the world, the illustrations make use of maps and globes to advantage. A secondary effect of the Tintin comics is that they (intentionally or not) teach readers geography – even if some of the lands in the comics are totally made up. 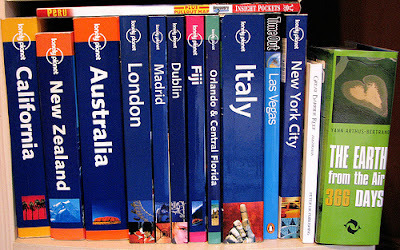 This, plus the simple drawings resulted to some children developing a curiosity for other countries, and the love of adventure. This is, of course, applicable where the Tintin comics is well-known, like in Europe, Africa (especially formerly Belgian Congo) and Asia. 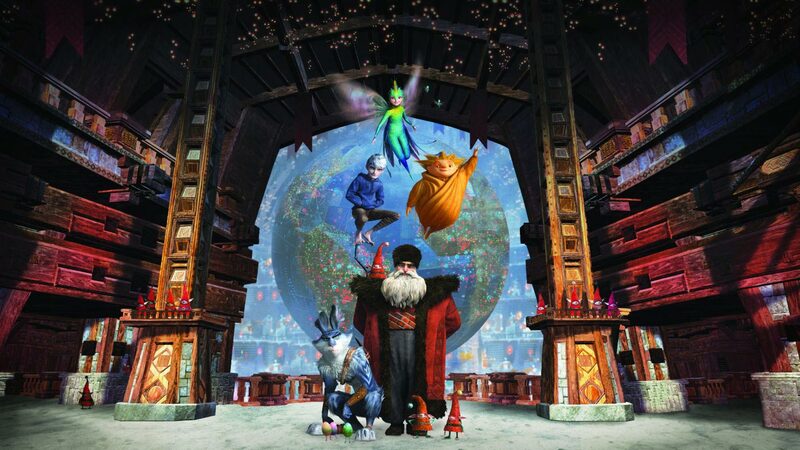 The treasure in globes – the gift of learning about places and adventure, is perhaps alluded to by one of the Adventures of Tintin books, Red Rackham's Treasure, published in 1944. In the book's conclusion, Tintin and his friend, the hard-drinking Captain Haddock, finds the treasure hidden by Haddock's 17th-century ancestor by way of a globe that served as the base of a statue of St. John, the Eagle of Patmos. By pressing the equivalent of the island previously encountered by the adventurers, the globe sprung open to reveal the treasure. 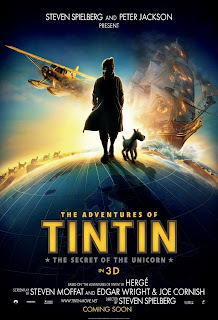 The importance of globes as a storytelling device in the Tintin books is underscored by literally having a globe as the ground in the poster for the 2011 motion capture adaptation of the comic books, The Adventures of Tintin. 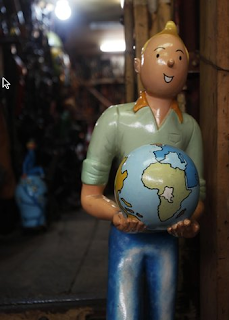 A children's globe would be the perfect companion for The Adventures of Tintin, should you want to expose your kids to the love of geography. We carry a good selection of Children's Globes. 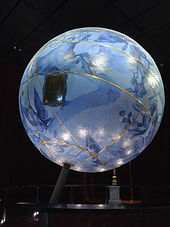 The Earth by Day and Night globe is particularly good for teaching because it's an ordinary learning globe by day but shows the constellations in the night sky when you turn on the illumination at night. 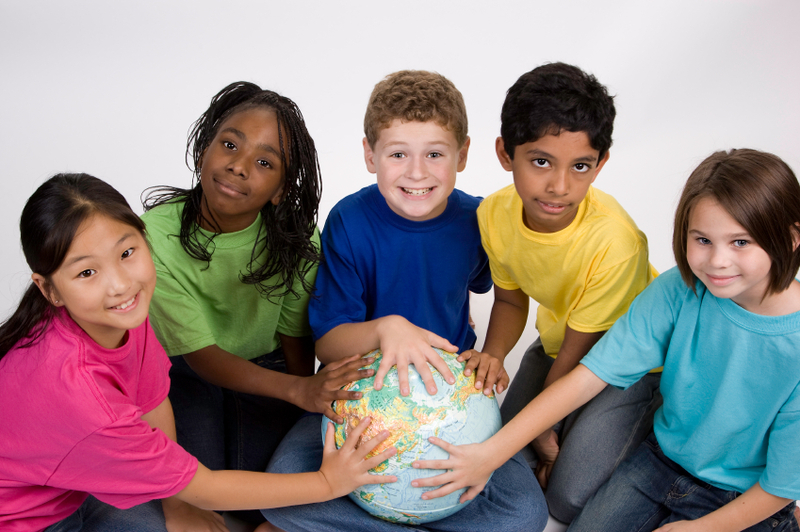 Globes may not give your kids a literal treasure of gold, but they'll develop a treasure no one is going to steal: knowledge. Although pretty and precious, jeweled globes are not the pinnacle of globemaking. Instead, the highest achievement of the globemaker's art is found in the details, accuracy, and care employed in the making of a sturdy globe. 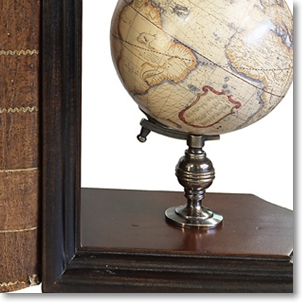 By this measure, Replogle, one of the world's most famous globemakers, has come up with "The World's Most Detailed Globe" yet seen, the Diplomat. 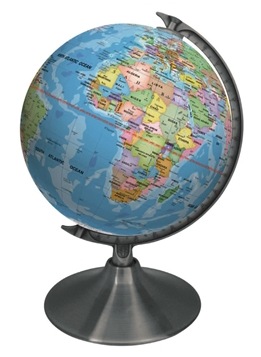 This 32-inch floor-standing globe has more than twenty thousand place names. 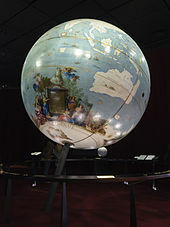 In contrast, one of the biggest (around four feet across) enamel jeweled globes in the world, the Byzantine, only has five hundred place names (at $500,000.00, that's $1000.00 per place name—39 times more expensive than the Diplomat's $12,900.00 price). At the huge end of the scale, the Guinness World Records holder of the title "World's Biggest Globe", the Eartha, at 41 feet in diameter, has no place names (to be fair, the Eartha is only a model of the world seen from space, not intended to be geographically informative or functional). Like its idealized namesake, the Diplomat is elegant but tough as brass (its meridian is made of hand-engraved brass), polished but hard (its cradle mounting is made of mahogany hand-burnished to a smooth walnut finish), bright but stylish (touch the brass meridian, and the Diplomat will light up to reveal its ten-color cartography in all its glory). 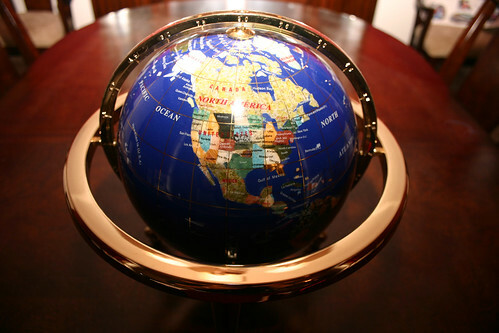 No matter how up-to-date a globe is when first bought, the world's political climate and boundaries change. The Diplomat has been intended to keep up with recent world political changes by being updatable. 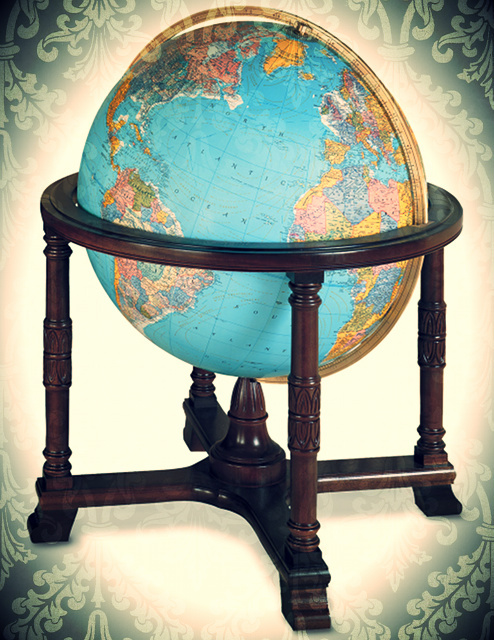 Owners have the chance to update their Diplomat globes for half the retail price through the Updatable Globe Program by its manufacturing company, Replogle. Diplomacy is not for everybody but, for the discerning globe owner or institution, the depth of information and breadth of detail that comes with the Diplomat is important for accurate and authoritative geography. Elegance is but a byproduct of the attractive ideas that went into the Diplomat's making. It is Alex Chacón’s requirement to his path of self-discovery—his journey from Alaska to Argentina by motorcycle. From Alex Chacón’s blog (http://www.expeditionsouth.com). “When I was a little kid in elementary school I'd always look at the world globe and realized how small we were, and the different places there were. So over the years I kept figuring out how I was going to go all around the world, and get to know the world before I got to know myself,” says Chacón. It is also the first of such a trans-America crossing, spanning 503 days, 82,459 miles, 22 countries—from freezing Alaskan tundra, to steaming tropical jungles, raging Amazonian waterfalls, and back to the cold—in the isolated wilderness of Patagonia. “я теперь спать﻿ не буду... респект автору! [I'm not going to sleep now ... Respect to the author!] Respect and honor! lightly envious of …” wrote Igor Batenev. “watched this from Start to Finish and genuinely wished there was more! awesome adventure man, I don't drive a motorcycle but I want to after watching this﻿ and take it across the same route :O” said Thomas O'Sullivan. “Muito bom! Vc acaba﻿ de realizar o sonho de muita gente [Very good! 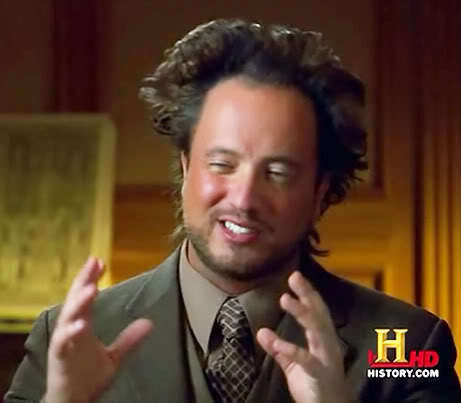 U just realized the dream of many people]” wrote Paulo Henrique Boblitz. It’s wonderful to see such a dream realized. To think it all started with just a world globe. One wonders if the same dream could have ever been made if Chacón were not able to hold a real world globe in his hands. 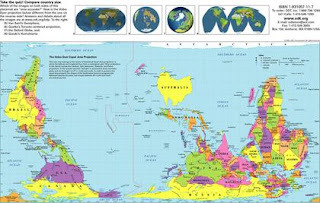 Could computer maps and virtual globes create such a sense of wonder in a child? By extension, what sort of creativity do virtual worlds—video games for example—produce in a child? We can only wonder. You too can dream and achieve. And dreaming is much better with a globe in your hands.